Usual practice is to charge for signing. Since when have I been bound by usual practice? No charge — just bring to the event a bottle of great Port and the book, and I’ll happily sign. I have a group purchase to order, but am not sure that all interested have had the opportunity to respond. I leave for Portugal next Thursday. Safe to wait to place the group order until at least Oct 3, or will orders have closed by then? I've just listened to the esteemed author on The UK Wine Show ThirtyFifty podcast where he talks about vintage port. Very entertaining and well worth a listen. There's also a follow up podcast which I haven't listened to yet, where he talks about The Book. Both very good, very well worth a listen. Yes, and Part 2 of their conversation is up as well. I was slightly disappointed that neither episode featured the actual drinking of Port. I was the guest — it was worse for me! Stock is running low, and sales are about to end. If you have, thank you. 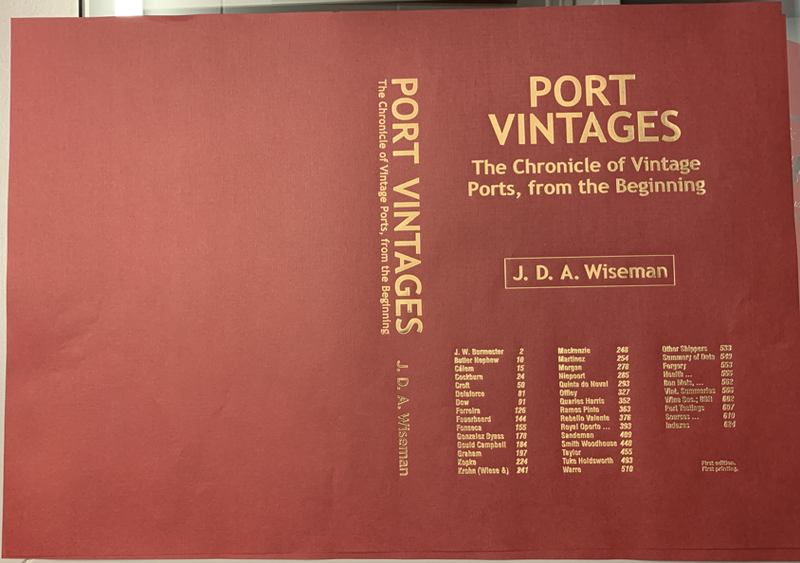 If you haven’t, then www.PortVintages.com. The shop is closed. Supply is not quite exhausted (about 90% sold), but for the moment the shop is closed. Cloth-bound books are set to arrive at the fulfilment company on Wednesday 28th November. Hence they are likely to be in the hands of UK readers early in the week beginning 3rd December; European and US readers later that week or early week of 10th December; and Australian readers not long after that. Leather-bound books are likely to be ready in early January. Notes to self: FTLOP thread; JancisRobinson.com thread. The printer has sent me a picture of an unfolded hardback cover, which will be attached to the inside pages tomorrow (Tue 27th Nov). > Just to let you know, within the past hour we have took delivery of the books – 3 pallets. Two copies were sent by the printer directly to my home, and it looks good. I’m confident you will be pleased. Reading it will take you several magnums. Anyway, some of you are doubtless impatient for this pleasure. When your treasure arrives if you are able to post in this thread on ThePortForum (or, when it’s working again, on FTLOP), please help the others by posting to say when it arrived. Please also say approximately where you are in the world, and whether you are remotely rural or speedily urban. An ambiguous message was been received from the fulfilment company, at about 4pm today = Fri 30th Nov.
> Just to let you know, the job is ready for dispatch. I will have the bulks dispatched on Monday, so you should receive yours by Tuesday. Given that fifty are being delivered to me, that might mean that the non-bulks have been shipped today. Have they? And how many books is “bulk”? I asked by email (no reply); I phoned (several times; phone not answered). Sigh. The ambiguity is not my fault, except in the sense that it came from my subcontractor. Sorry: I do understand that it irritating me does not help you. So, when your book(s) arrive, if you are able to post in here on ThePortForum (or on FTLOP), please help the others by posting to say how many arrived, and when. Please also say approximately where you are in the world, and whether you are remotely rural or speedily urban. Despite this, I’m confident you will be pleased. Reading it will take you several Imperials. The author has confessed to finding an error in his copy of The Book. One error in 395,000 words. I am deeply impressed and look forward enormously to receiving my copy. On Christmas Day I shall be ignoring the family and reading The Book. Message received from the fulfilment company, at about noon today = Mon 3rd Dec.
> The singles (1 copy) mailed on Friday and bulks (2 and above) are leaving from today. You will receive yours tomorrow. 10 boxes. I know that a single ordered to London did not arrive today, but tomorrow, Tue 4th Dec, is surely quite likely. As said before, please, when your book(s) arrive, if you are able to post here on ThePortForum (or on FTLOP), please help the others by posting to say how many arrived, and when. Please also say approximately where you are in the world, and whether you are remotely rural or speedily urban. PS: the ‘advertising’ did say “Delivery expected before Christmas”; tomorrow is three weeks before that day. Alas (feel my pain!) this omits a Cálem Quinta da Foz 1958 on p18. But page 18 is opposite p19, to which there is a pointer (twice — Cá63 and CáF66), so readers are no more than slightly disadvantaged. Reports have been received of single books arriving in Cornwall, and in St Andrews. A bulk shipment of books arrived in South London. But a single that was ordered to be delivered to my office in central London did not come today (Tue 4th Dec). Edit: also a single near Romford. My order for a single volume arrived this afternoon between 16.00 and 17.00 GMT. It was delivered to me in Sanderstead, approx 10 miles south of Charing Cross in C London. At first look it is just as impressive as I hoped and expected from the Author. I am very much looking forward to some quality quiet time to give it the attention it deserves. I am, of course, more than happy to sign page 608 for anyone that wishes. I had a UPS card for a missed delivery yesterday, so I anticipate picking up my delivery this afternoon. I picked up my copy this afternoon. I look forward to a long, long read.